I know I risk the ire of my patient readers by saying this, but, in my opinion, Edward Scissorhands is not a good movie. I’d like to stress that it’s not terrible, either. The main reason I consider it bad is because it fails to live up to its potential. It comes so close to being great, but it always finds a way to disappoint. However, Danny Elfman’s soundtrack is perfect, and I think it’s some of his greatest work. 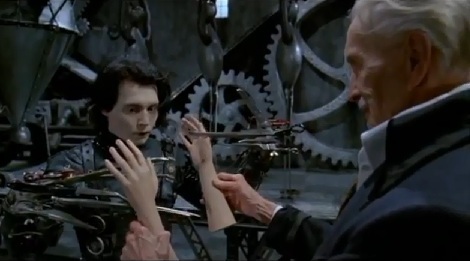 Edward Scissorhands is basically a modern twist on the classic Frankenstein story. Its heart lies in its main character Edward and his relationship to a teenage girl named Kim. Johnny Depp and Wynona Rider are perfect in their respective roles, each acting vulnerable, kind and confused at just the right times. The music that plays in the scenes between them is full of yearning and joy, as well as a twinge of sadness. Edward is a complicated character. He’s been alone for a long time since his creator died, but instead of becoming bitter or angry, he’s shy and eager to help. He hates violence, but he’s cursed with a violent form. I love that we get to see Edward’s creations before actually meeting him. He’s rather frightening-looking, so if we just saw him first with his sharp scissors, blank face and wild hair, we would probably be prejudiced against him and might have a hard time overcoming that initial impression. Most of the townspeople get to meet Edward the first way. They hear there’s a new man in town, and they’re all eager to meet him instead of being afraid. But Kim (the daughter of the woman who takes Edward in) first sees Edward when she sneaks into her house after a long trip. She’s in her bedroom when she suddenly notices Edward lying on her waterbed staring at her. She screams and (in my favorite gag of the movie) Edward accidentally rips apart her waterbed. While the townspeople like Edward at first, they soon question his intentions and start to fear what he’s capable of. However, Kim is frightened and annoyed by Edward at first, but she slowly learns that there’s something special about him and she actually falls in love with him. Edward Scissorhands’ biggest flaw is that it never allows itself to be great. There are plenty of good moments, but most of them end horribly. I’ll show you what I mean. In one scene, it’s nearly Christmas and the Boggs family is putting up Christmas decorations. Kim sees something she’s never seen before in her hot California suburb: snow. It’s actually shavings flying off an ice statue that Edward is feverishly working on. The music swells to a beautiful crescendo as she goes outside and dances in the “snow.” There’s no need for any words. We can see in her face and movements that she’s falling in love with Edward. But then, right when it looks like it’s about to turn into a perfect scene between Edward and Kim, Kim’s boyfriend Jim arrives. He shouts at them, making Edward turn in surprise and accidentally slice Kim’s hand. This magical scene ends way too abruptly. Maybe writer/director Tim Burton was making a statement about how precious those moments are and how easy it is to ruin them. To me, it shows how a perfectly setup film can quickly fall apart. This happens several times, too. When Edward appears on a TV show, it ends with him sort of staring at Kim through the camera, but then he suddenly touches a mike with his scissor hand and gets horribly shocked with electricity. Later, a romantic scene between Edward and Kim is interrupted by Jim and his friend drunkenly driving down the road and nearly killing a pedestrian. The movie never allows the audience to just sit back and enjoy a scene to the fullest. The filmmakers don’t always know how to end a scene, so they think they need to end it with a bang or something to grab the audience’s attention. But they already have it, so the surprise endings are too much. 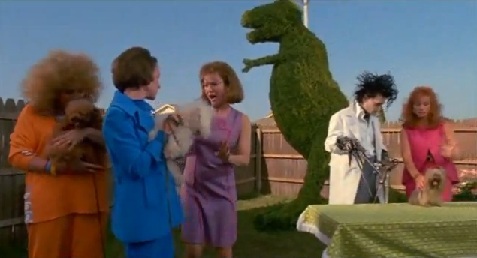 The first half of Edward Scissorhands is comical and lighthearted, but it also has hints of danger and sorrow. I wish the movie would have stayed on that path and delved more into Edward’s psychology. How would a man who came so close to getting what he always wanted react to suddenly losing it like Edward did when his creator died holding his new hands? We never really know. Edward is quiet and doesn’t explain much about himself. The flashbacks give little insights into his character, but not enough to really satisfy our questions. The filmmakers also should have found a better conflict for such an intriguing character than dealing with a jealous boyfriend. Jim’s transformation from arrogant teenager to cold-blooded killer is as abrupt as the rest of the film. There’s a brief explanation about how his father is extremely possessive about his property and refuses to share his wealth with his son. Maybe that attitude rubbed off on Jim… to the extreme. Oddly enough, this sounds a lot like Cameron Fry’s plight in Ferris Bueller’s Day Off. And that movie was written and directed by John Hughes, who also made The Breakfast Club and Sixteen Candles, both of which featured Anthony Michael Hall, the actor who played Jim in Edward Scissorhands. How’s that for obscure movie connections? Back to the discussion at hand, Jim acts a lot like Gaston if he had actually been able to date Belle in Disney’s Beauty and the Beast. He’s just a selfish bully for no good reason. Even though Edward does his best to help Jim, he gets no thanks and is only treated with hostility. I guess Jim is overprotective of his things, and he considers Kim more of a possession than a person, so he hates the idea of losing her to Edward. But how would beating Edward up or even murdering him accomplish his goal of making Kim love him again? Maybe Jim’s psyche could have used more explanation, as well. Unfortunately, the only solution to the bully is violence. Rather than show how Edward grew and learned from his experiences in town by having him find a creative solution to Jim’s anger, this film actually implies that Edward has become a worse person because of his experiences. He’s now capable of murder. Certainly Jim was acting outrageously, and Edward was justified in defending himself, but it would have been much more interesting to see him think his way out of this problem. Instead Edward Scissorhands takes the same simplistic approach as Beauty and the Beast. Just kill the villain. I prefer Back to the Future’s solution of humiliating the villain and forcing him to face the consequences of his evil actions. Again this is a situation that would have been greatly helped by showing more of Edward’s personality. Instead of presenting Edward as a killer, the movie should have shown how Edward had felt about being unable to save his inventor’s life, and now he has a difficult time bringing himself to willingly take Jim’s life, even if it costs his own. This opportunity for more depth, however, is lost. The music is consistently great in Edward Scissorhands. The scenes near the start in which the housewives are gossiping and spreading rumors about the mysterious new man in town are accompanied by suitably mischievous music. But where the movie really shines is in the quiet moments between Edward and Kim. When they gaze longingly at each other, the haunting melody that plays tugs on your heartstrings and makes you yearn for them to be together. Despite the movie’s unique visual style, the music actually has an even more lasting impression. Even if I can’t remember a specific scene or image, I can remember the music and how it made me feel at that moment. This is especially true when Edward finds Kim on Christmas Eve after he goes on a tirade. They finally express their feelings for each other and Kim asks him to hold her. He tries, but he realizes his hands are too dangerous and he doesn’t want to risk hurting her so he quietly replies, “I can’t.” He moves away from her, but she refuses to take no for an answer and she does what everyone in the audience is aching for her to do and she climbs into Edward’s arms and holds him tight. You have to see this moment unfold to understand its power. The music is an indispensable part of making it both memorable and powerful. How did Edward get all of the newspaper clippings of other deformed and/or gifted people? Did he leave the castle often? Maybe that’s how he came across ideas for some of the more spectacular garden sculptures he made. Was the religious woman who hates Edward for no reason really necessary? I know she’s supposed to foreshadow how the rest of the people in the neighborhood will treat him, but she comes across as a lame stereotype of Christians. Why would seeing a can opener trigger a memory in Edward of how his inventor came up with the idea to create him? Edward certainly wasn’t able to witness his own creation, so what are we seeing there? Maybe the inventor told him how he came about. If Jim’s dad is so overbearing, wouldn’t he demand a full investigation into his son’s murder? And wouldn’t the police quickly discover Edward isn’t dead and lock him up again? How did Edward manage to lift huge blocks of ice into the attic of his castle? Do they just form naturally in the winter? Any insights you might be able to share into these questions would be greatly appreciated. You can leave a comment below. Even though I’ve dwelt on its flaws, there’s a lot to like about Edward Scissorhands. For example, the police officer who cares deeply about Edward. It’s a small part of the film, but it says so much. Edward was caught breaking into Jim’s house, even though he didn’t want to steal anything; he was just trying to help. The police arrived and told him to come out and drop his “weapons.” He couldn’t drop them because they’re his hands, and he was too petrified with fear to explain that. Just as the police are about to open fire, some Good Samaritans show up and save Edward’s life. Later, the police officer who was about to kill Edward tells him he was up all night worrying about him and asks him to take care of himself. And when he has a chance to kill or arrest Edward even later, he just chases him back to the castle where he knows he’ll be safe again. The waterbed Edward sleeps on is a pretty clever touch, and it has a great payoff. The chattering housewives are a nice homage to The Music Man. Also, Stan Winston’s scissor effects are amazing. Winston is famous for doing the makeup and special effects for Terminator 2: Judgment Day, Aliens, Predator and a number of other big-budget films. His work on Edward Scissorhands is much more subtle, but no less effective. I’m especially impressed by the scenes of Edward cutting dogs’ and women’s hair. Winston manages to preserve the danger and the wonder of what’s happening. Edward Scissorhands could have been a great movie. But it never developed its plot enough, and the climax where Edward kills a confused teenager lacks emotional depth. Johnny Depp and Winona Ryder give career-making performances, elevating this from a Frankenstein knockoff to an affecting romance. And the music does a spectacular job setting the mood. Again, I don’t hate this movie. I just wish it was better handled. All photos from Edward Scissorhands are the copyright of Twentieth Century Fox. This entry was posted in Bad Movies with Great Music and tagged back to the future, beauty and the beast, california, christmas, danny elfman, disney, drama, edward scissorhands, film score, films, frankenstein, holiday, john hughes, johnny depp, movie review, movies, music, relationships, romance, soundtrack, tim burton, winona ryder. Bookmark the permalink. I see your point. That just doesn’t add up to a particularly satisfying film when it keeps stopping short of greatness, even if it is on purpose. I’m always learning, and I trust that if I make a misstep here and there, I’ll correct it over time. 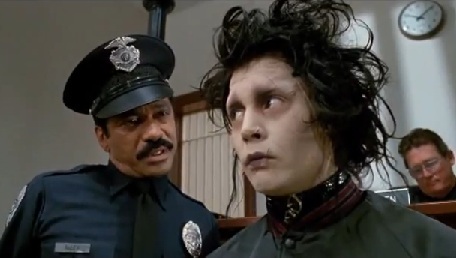 I’m sorry to hear that you don’t agree with what I wrote about Edward Scissorhands. I hope you’ll enjoy many of the other articles I’ve written, though. Have a great day. It’s not Frankenstein so much as Romeo and Juliet. And the shortcomings you perceive are actually strengths, and entirely intentional. The heart of the film can be summed up by Edward’s own, offhanded statement which was largely ignored by the characters they were spoken to; “I’m not finished.” This theme permeates every nook and cranny, and is expressed brilliantly in the score as well. Edward’s theme habitually ends without a musically satisfying termination. “He’s not finished” is repeated by Danny Elfman constantly. The score is a work of absolute genius when considered in service to the story. Although I wasn’t bothered by the interrupted moments in the movie or the mysterious block of ice, when this review is discussing character development, it perfectly encapsulates everything wrong with Edward Scissorhands. It’s a beautiful film – but that’s all, and there’s really very little to admire beneath its sugarcoated exterior. And parallels to Asperger’s syndrome don’t make up for the simplistic characters, underdeveloped plot, lack of moral depth, and the ridiculous ending focused entirely around the death of a character we don’t even like.